Quality Air Heating and Air Conditioning > Articles > Heating > Is My Gas Furnace in Trouble? Is My Gas Furnace in Trouble? We understand that homeowners are sometimes hesitant to schedule repair services, even for something as important as a heater. Sometimes they may be duped into thinking that everything is fine, so long as the heater is still operational. In other instances, they may just want to wait until the winter season has passed before having their heating system repaired. Well, we are here to tell you that prompt heating repairs are always in your best interest. Not only can problems with your gas furnace lead to a subpar heating performance, but they could also create an unsafe environment in your home. 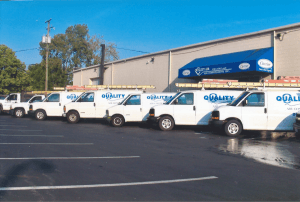 Review the information following in this blog, and remember that gas furnace repairs in Columbus, OH are always a top priority. Are you using your gas furnace the same as you always do, but notice that your gas utility bills are getting out of hand? If so, you may have a problem with your gas furnace that is causing it to run inefficiently. If the problem is with your gas delivery or combustion components, you seriously need to have it resolved promptly. The last thing that you want is a gas leak in your home, or the introduction of CO in your house due to incomplete combustion. Your furnace is not going to operate silently, but it also shouldn’t make very loud, alarming sounds when it runs. If your gas furnace comes on with a boom, for instance, the burner may not be igniting quickly enough, allowing gas to build up before combustion. This is called “delayed ignition,” and is just one of several potential sounds of trouble you’ll come across. Is your furnace cycling on and off too frequently, wasting energy in the process? If so, it’s possible that the furnace is just too large for your home. If it has not been an issue in previous years, though, it likely means that there is a problem with the furnace requiring repairs. However, you could also have a problem with your thermostat, or even with a thermocouple or the gas delivery system. Whatever furnace problems you may have, schedule your gas furnace repairs with Quality Air Heating and Air Conditioning.